Assembly Speaker Sheldon Silver walks towards his vehicle after his arraignment in federal court on Jan. 22, 2014. 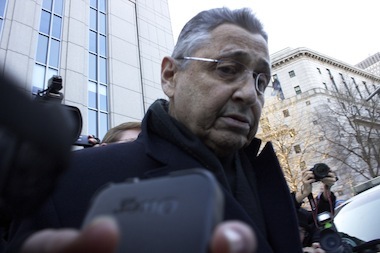 NEW YORK CITY — After three days of deliberations, a federal jury found former Assembly Speaker Sheldon Silver guilty Monday on all seven counts of fraud, extortion and money laundering related to two bribery schemes. Jurors returned the guilty verdict in a packed courtroom, just after 4 p.m., after a fast-moving three week trial with 25 witnesses. Silver sat quietly as the foreman of the jury repeatedly said "guilty" after each charge. The verdict comes after a short but relatively dramatic period of deliberation — two different jurors, including one earlier in the day had asked to be dismissed. Silver, 71, was the focus of a major anti-corruption push by U.S. Attorney Preet Bharara, who took aim at what he described as a network of corruption in Albany. “Today, Sheldon Silver got justice, and at long last, so did the people of New York,” Bharara said in a statement released immediately after the verdict. Prosecutors said Silver, who stepped down from his powerful position as speaker of the Assembly after he was indicted, abused his office to earn nearly $4 millon in kickbacks disguised as a legitimate salary. At the center of the trial was the question of how business and politics intermingle in Albany. Prosecutors said Silver abused his power for personal gain, while defense attorneys argued that Silver was acting within the law, even if people were uncomfortable with a system that allows for legislators to earn an outside salary. As Silver, flanked by his attorneys, walked out of court into a crush of news media waiting for comment, he told reporters he was disappointed but would keep fighting the charges legally. "I'm disappointed but we'll continue the legal fight," he said. "Ultimately I believe that after we file the legal challenges, we'll have a different result." Silver, prosecutors claimed, earned kickbacks through work he purported to do for personal injury law firm Weitz & Luxenberg and, in a separate scheme, through fees from a small real estate law firm. In the Weitz & Luxenberg scheme, prosecutors said prominent Columbia doctor, Robert Taub, sent patients who suffered from mesothelioma, a cancer caused by asbestos, to the firm through Silver. In exchange, the doctor was given $500,000 in research money through state grants and other favors, while Silver earned referral fees from the law firm. Silver also took what he called referral fees from a real estate tax law firm while he directed tax breaks to two developers, including Glenwood Management, the largest political donor in the state, prosecutors said. Prosecutors argued throughout the trial that Silver tried to cover up his fraud by lying about his work, saying that none of his clients had business with the state even though he was being lobbied by Glenwood Management. Defense lawyers, however, made the case that the only people who have been misleading are prosecutors. To prove corruption, there must be proof of "quid pro quo" — meaning something in exchange for something else, the defense said. No witnesses said that there was ever any explicit agreement. Silver had previously said that he would be vindicated.